HANOI - Prime Minister Nguyen Tan Dung on Wednesday asked the US Congress to increase aid to Vietnam in order to alleviate and combat the effects of Agent Orange. Dung made the request during a meeting with Thomas Harkin, chairman of the US Senate Committee for Health, Education, Labor and Pensions. The leader applauded the US delegation's visit to the Agent Orange clean-up site in central Vietnam, and said the practical activity would boost co-operative relations between the two countries. 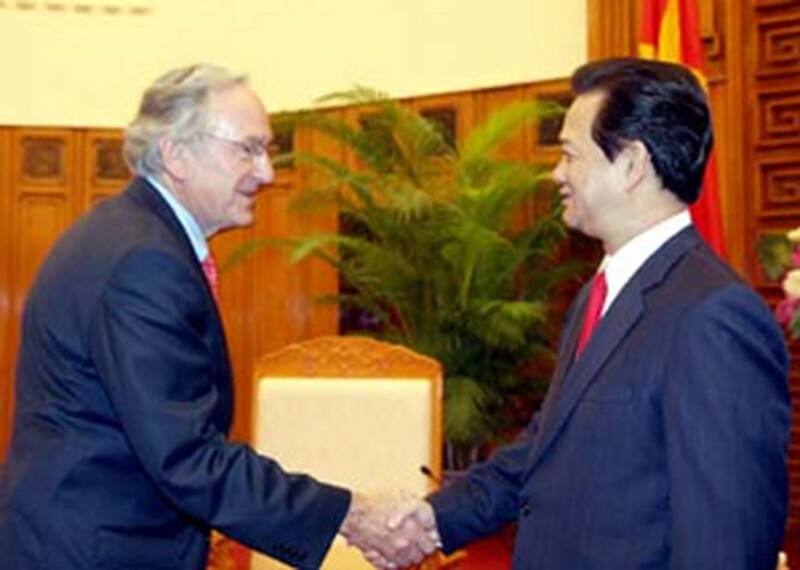 Dung appreciated Harkin's contributions to relations between the two countries, and thanked him for his support of the US aid that had been given to combat the effects of the toxic chemical. The Prime Minister said Vietnam was pleased to see the development of the multifaceted co-operation between the two countries, which will benefit both countries, especially in trade and investment. Dung said he hoped the US Government would continue to assist Vietnam with efforts to clear mines and bombs and recover the remains of 300,000 Vietnamese people who died during the war. He also expressed his expectation that as the chairman of the US Senate Committee on Health, Education, Labor and Pensions, Harkin would continue to boost co-operation between the two countries in fields like health, education, labor and climate change response. Senator Harkin noted that he was impressed with Vietnam's socio-economic development and pleased with the increased co-operation between the two countries during the past 15 years. The senator affirmed that he would play a more practical role in fostering co-operative ties between the two countries in the health, education and trade sectors. Harkin said that it was the duty and responsibility of the US to help Vietnam solve the problems caused by Agent Orange. Harkin paid his first visit to Vietnam in 1995. He supported the anti-war movement during the American War. He also supports Vietnam's current trade relations with the US. Also yesterday, the US delegation was welcomed by Minister of Labor, Invalids and Social Affairs Nguyen Thi Kim Ngan. During the meeting, Ngan said, "We will continue exchanging and supplying information on issues of mutual concerns relating to labor and the rights of laborers." She said that the senators' interests had a large influence on the development of Vietnam. American non-government organisations (NGOs) had co-operated well with Vietnam, which had resulted in successful achievements in social security, she said. Through NGOs, tens of millions of US dollars had been used to improve the country's health care and infrastructure sectors in poor regions. The NGOs had also helped create jobs for the poor and disabled. The minister also said that she hoped to boost co-operation and understanding between both countries concerning labor inspections, adding that the two countries would join hands in projects to recover remains of people who died during the American War. Senator Harkin said he was glad that the National Assembly approved the Law on Disabilities, affirming his readiness to co-operate with the Vietnamese Government in dealing with issues concerning labor and the rights of laborers. He said he supported Vietnam's effort to increase workers' rights and living standards, while also improving trade relations. In the meeting with the vice chairman of the National Assembly Nguyen Duc Kien yesterday, Harkin said confronting and ameliorating the consequences of Agent Orange was an important issue and a moral responsibility. Kien acknowledged the positive and efficient developments in the relationship between the two countries and legislative bodies. He also said he hoped that the senators would support increased trade between the two countries and remain committed to the agreements made by both sides on co-operation deals in health, education and training, and eradicating the effects of Agent Orange in Vietnam. Meanwhile, the US parliamentarians held a press briefing on the results of their Vietnam visit. Harkin said that based on statistics collected during their trip to witness dioxin detoxication activities in the central city of Da Nang, one of the hardest-hit localities during the war, the clearance of the toxic chemical was feasible. He also pledged to try his best to speed up the detoxication process in Vietnam. Regarding the two countries' 15-year-old diplomatic ties, Harkin said members of both the US Senate and House of Representatives were positive on development of ties. "We cannot change the past but we can make the future better," he said. Senator Bernie Sanders said he was proud of achievements in Vietnam-US relations over the past 15 years and vowed to further develop the bilateral ties. He said the Agent Orange/dioxin issue was also one for many US war veterans as the chemical had seriously affected them and their families.